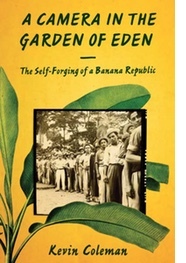 Kevin Coleman is the author of A Camera in the Garden of Eden: The Self-Forging of a Banana Republic. Berta Cáceres, winner of the 2015 Goldman Environmental Prize, was murdered on March 3, 2016 in her home in Honduras. Credit: Goldman Environmental Prize. A mother of four, an environmental rights activist who led her indigenous community in opposing one of Central America’s largest hydroelectric projects, a woman whose murder had been announced years in advance: this was Berta Cáceres. In early March, at one in the morning, gunmen entered her home in La Esperanza, Honduras. They shot her dead, and wounded fellow activist Gustavo Castro Soto. The daughter of a mother who cared for refugees from El Salvador during the 1980s, Berta Cáceres was just twenty years old when she cofounded COPINH—the National Council of Popular and Indigenous Organizations of Honduras. Through this small volunteer group, she organized against illegal logging in the highlands of western Honduras. She helped more than one hundred communities of subsistence farmers secure legal titles to their land. And she worked publicly to mobilize thousands of people on pilgrimages to municipal and national seats of power to protect the forests, rivers, and subsoil rights of the communities of Intibucá, La Paz, and Lempira. In the face of a concerted effort by the Honduran government, international finance, and some of the world’s largest engineering companies, Cáceres worked with other concerned citizens to insist on democratic processes of consultation—a demand that is consistent with international treaties on the rights of indigenous peoples. Meanwhile, the Honduran military deployed its First Engineering Battalion to secure the company compound of China’s Sinohydro, which had been contracted by DESA, a local engineering firm, to dam the Río Blanco with financing from the World Bank’s private sector arm, the International Finance Corporation. As a public face of an ethnically diverse environmental movement, Berta Cáceres led nonviolent marches and blocked roads in an attempt to stop the construction of the Agua Zarca Dam, a mega hydroelectric project that would have powered mining operations planned for the highlands. For this, she was arrested and jailed. She was also threatened with sexual assault and death. The story of the coldblooded killing of this forty-four old mother and campaigner to protect the rivers and forests of her native land might sound familiar. It’s what used to happen in the bad old days of banana republics. Alas, it’s still happening. Honduras has long been an exceptional country that while nominally independent and democratic is effectively governed by foreign capital and self-serving local elites who use US-trained and equipped military and police forces to subvert the will of the citizenry. In the early twentieth century, banana companies with corporate headquarters in Boston and New Orleans backed dictator Tiburcio Carías Andino, who repressed uppity plantation workers on the north coast. And today, multinational conglomerates team up with the National Party’s Juan Orlando Hernández to undertake everything from sewing underwear for Wal-Mart stores to massive mining projects. Yesterday’s “banana republic” is today’s libertarian ideal of a barely regulated place in which profits can be extracted from land and labor while money flows freely. Banana republics were countries in which the fruit companies that we now know as Chiquita and Dole combined forces with the military and diplomatic arms of the United States to effectively govern, eclipsing the political capacity of local officials. When 25,000 banana plantation workers went on strike in 1954, they envisioned, and momentarily produced, a more egalitarian and democratic Honduras. But a bilateral US-Honduran military treaty and the firing en masse of more than 10,000 workers helped to restore a “flexible” labor force, one that had long since been dispossessed of its land and, thus, the foundation of its subsistence. The banana republics of ninety years ago were structurally similar to today’s Free Trade Zones, spaces in which the protections of average citizens, workers, and the environment are taken away, or just not enforced, so that profits can be maximized. These fruit companies were major transnational corporations, akin to today’s Exxon Mobile, British Petroleum, or the various mining companies that rip apart landscapes with financing routed through Toronto and New York, and engineering expertise from Vancouver, Munich, and Beijing. In some cases, even the laws that countries in Latin America use to facilitate mineral extraction have been written by corporate lawyers in Canada and the United States. With one of the highest per-capita murder rates in the world, Honduras stands today as an example of the near-perfect implementation of free-market, “small government” libertarian policies. Few countries have so thoroughly refused to regulate private industry, abandoning ordinary citizens and the environment to rapacious extraction and expatriation of profits. In 2014 alone, 114 environmental activists were killed in Honduras, as reported by Global Witness. Clearly the lives of those seeking environmentally and socially sustainable development have been deemed worthy of being sacrificed in a quest for short-term profits and easy fixes. 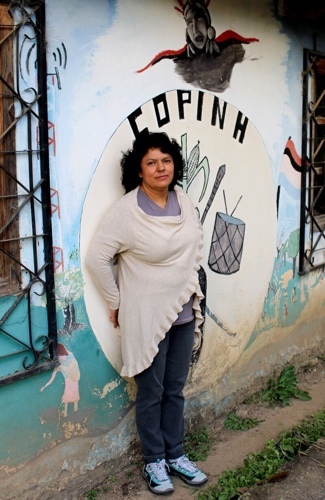 In 2015, Berta Cáceres received the world’s most prestigious environmental prize, the Goldman award. But even international recognition of her work was not enough to protect her from those who wanted the massive projects to bulldoze the land and livelihoods of the subsistence farmers with whom she had worked since 1993.